It's hard to believe that it was 30 years ago this week that Indiana Jones first made his way through the jungles and onto the big screen, forever changing the face of adventure. 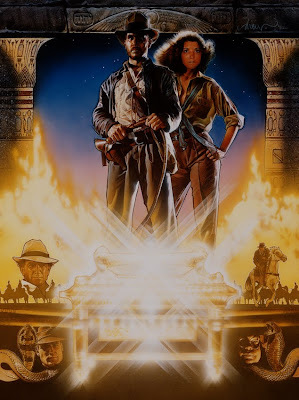 I'm not sure my young heart ever raced so fast as it did when the giant boulder chased Indy out of the Hovitos temple. Those first 5 minutes of film redefined cinema for me, and it's majesty and subtly echo through my mind as I focus on my own productions. I was inspired by the story, the characters, the history and culture, and of course, the design. Even the posters! 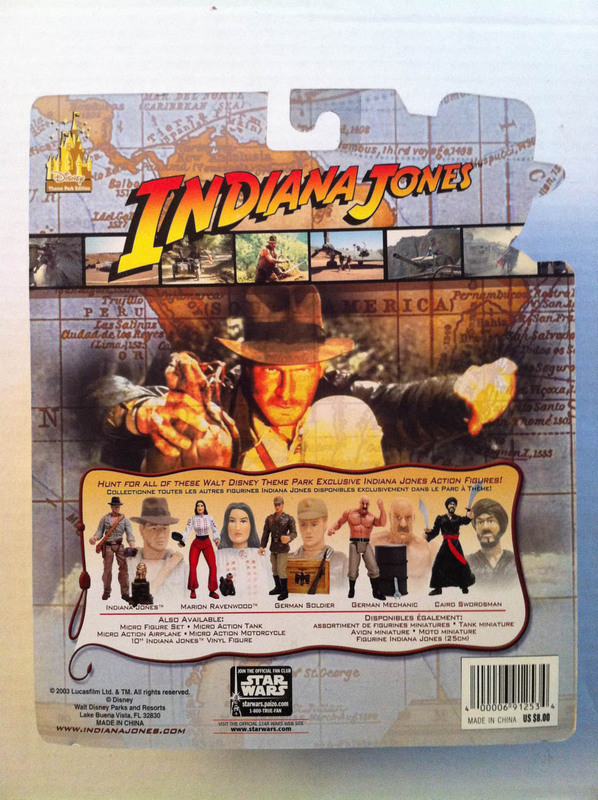 The image above by famed illustrator Drew Struzan, was highly influential in spurring my desire to pursue a career in art. 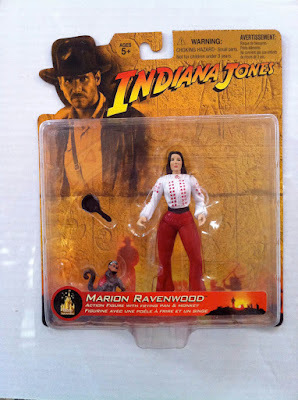 I wouldn't get to be officially involved with the Indy franchise until my brief animatronic snake project for The Last Crusade, but I created many pieces of Indy art before that. 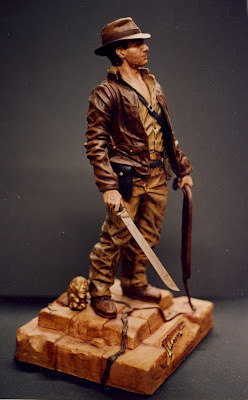 When I wasn't attempting (unsuccessfully) to emulate the master works of Drew through illustration, I worked on honing my sculpting skills with fan homages such as this Indy garage kit I did in '87. 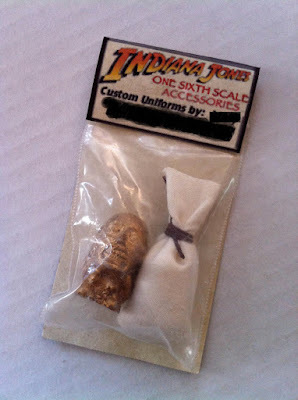 I made a few dozen copies of the kit that I sold or traded at model shows, and somewhere along the line, my Indy got re-cast and ended up all over the place. To this day, I still find copies, or parts of copies, popping up on ebay and at conventions. Most commonly reproduced is my version of the idol. I have a collection of other people's re-casts of my sculpt, ranging from this "1/6th scale accessory" to an official Lucasfilm action figure release that includes an injection molded version in the packaging! 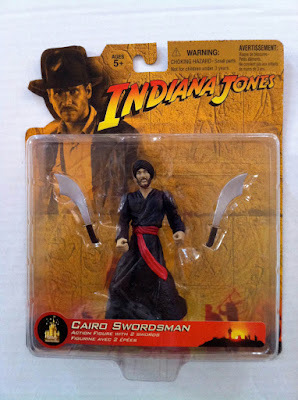 When Disney World opened the Indiana Jones Epic Stunt Spectacular, I was called in to do some merchandising. 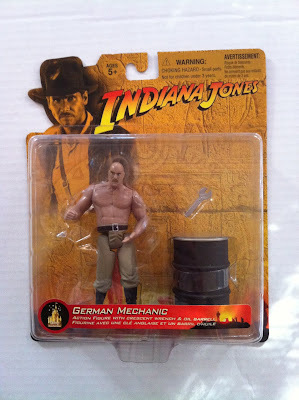 I was pretty excited to be able to make some official Indy product. At first, the Consumer Products division in charge of the project said, "You're a diehard fan! You tell us what we should offer our guests!" I put together an entire presentation, trying to fill in the gaps of the original Kenner Indy action figure lines. I proposed 2 figures from each of the films, a total of 6 in all. Indy, of course, and Toth with a melting face from Raiders, Shortround w/ crocadile and Mola Ram w/ stones and skull goblet, and Professor Henry Jones and the Grail Knight from The last Crusade. I was hoping to be able to expand the line to include Willie, Elsa, and Marcus Brody. 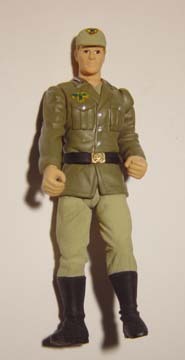 Unfortunately, you will never see my version of those figure. 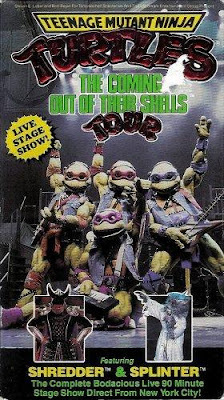 I do believe that at least a few of those characters and concepts are available now from different companies, but after getting everybody excited, myself included, Disney decided that they would get the most sales if the figures represented the characters audiences just saw perform in the live show. 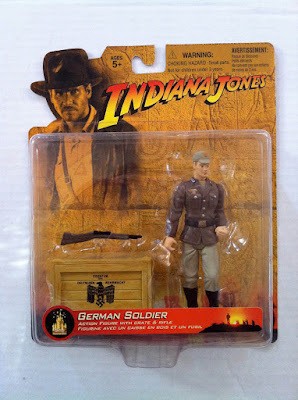 So the line up became Indy, Marion, a German Soldier, the German Mechanic, and a Cairo Swordsman. The gray Indy is my original sculpt, and the off-white is the Hong Kong prototype cast. The red marks are actually a putty the factory uses to "tool in" the joint connections. 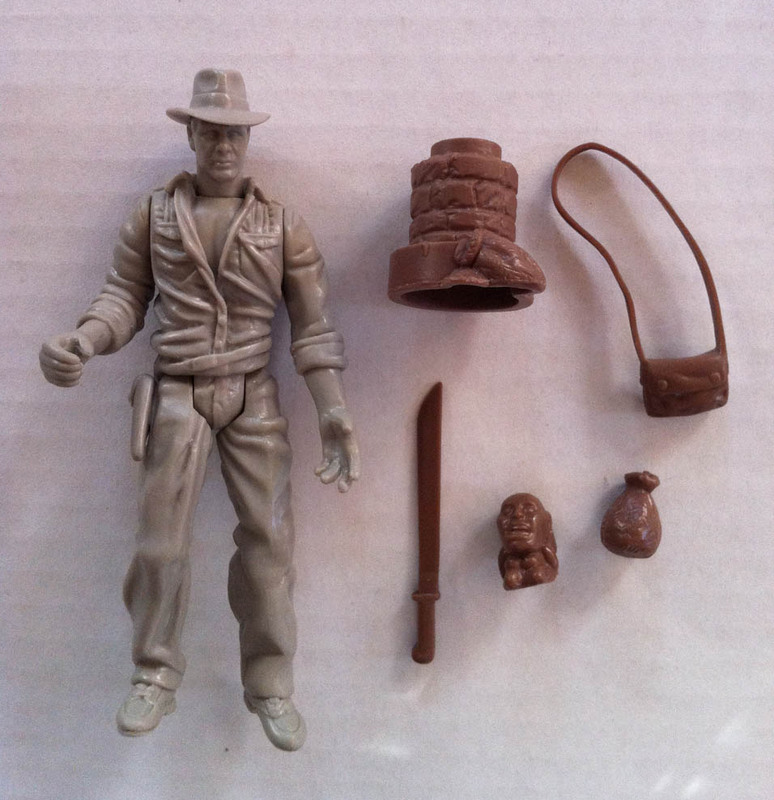 This is the first "test shot" of the Indy figure and accessories. A test shot is an unpainted cast from the first run out of the steel injection molds. They send a few copies to me, and some to Disney (or whomever is in charge of the project) to make sure that everything is correct. It is often too late to make changes at this point, because that would mean re-tooling the steel molds, which is very expensive, but if something is wrong, this is the last chance to notice it before full production begins. 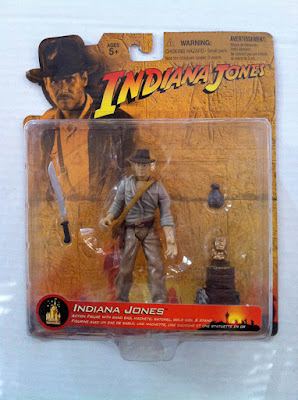 The final Indiana Jones figure for my Walt Disney Parks exclusive series. This is the original and tooling master for Marion. 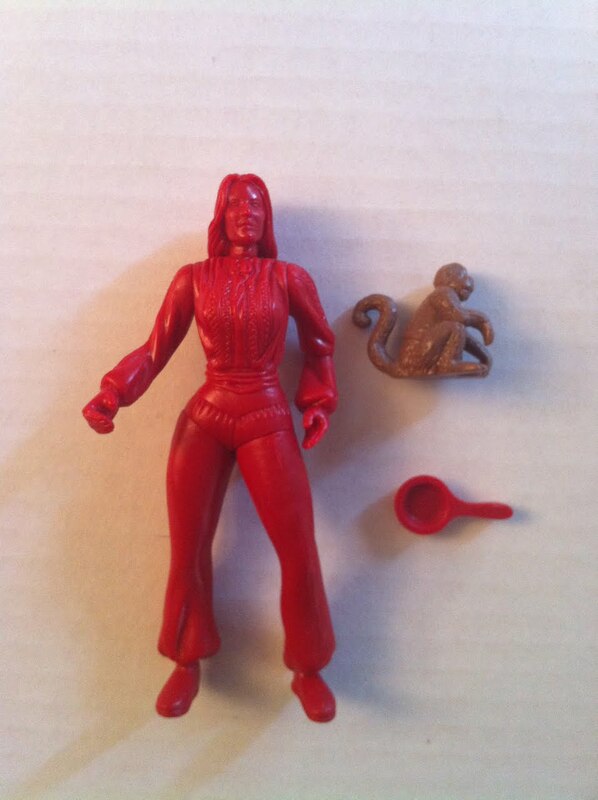 Something happened to this poor figure along the way, and the subtle pose I put her in became very awkward. I blame that red putty. I stared at these photos a lot during production, trying to figure out what went wrong. As best as I could sumise without actually going to China to review the assembly line, the bodies of my figures molded by milling solid steel, but the heads were molded using a nickle plating process directly on the tooling master. This allows for the details to be captured more accurately, but the final part often shrinks. If it is decided ahead of time that this process will be used, the original sculpts are done at 8% to 10% larger to allow for shrinkage. Since I did my sculpts at 100%, and the heads and bodies used two different processes, the proportions of the figures changed. A very small percent, granted, but enough to drive me crazy! The uncomfortable Miss Ravenwood! Gotta love the monkey, though! 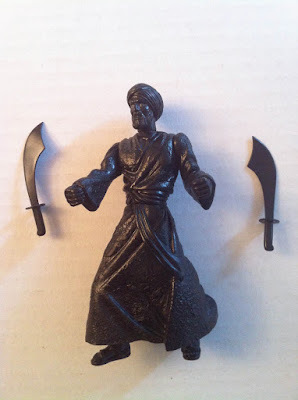 Here is the original and tooling master for the swordsman. I originally designed his cloak with a seperate lower "skirt", which was maintained in production, but the idea was for it to be a softer, more flexible material. 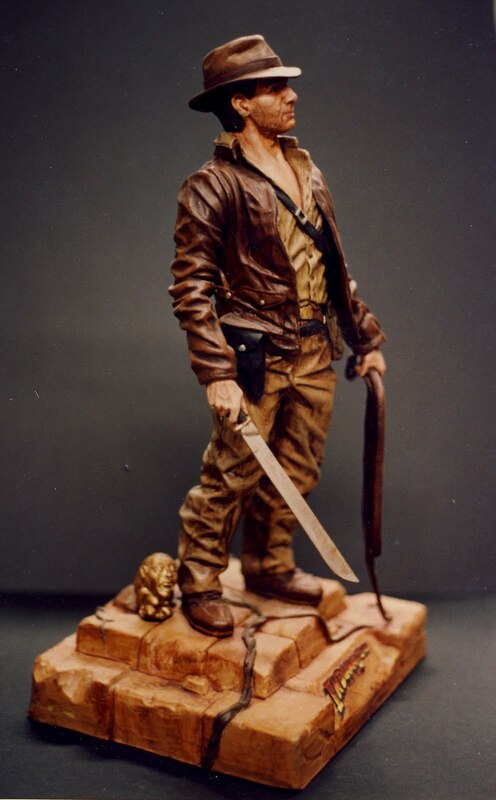 That part got nixed due to cost, so the figure looks cool with his giant swords, but if Indy ever runs into him, he doesn't have to worry about being chased. The Cairo Swordsman has very limited leg mobility! Original and tooling master for the German Mechanic. I made all the accessories, too. 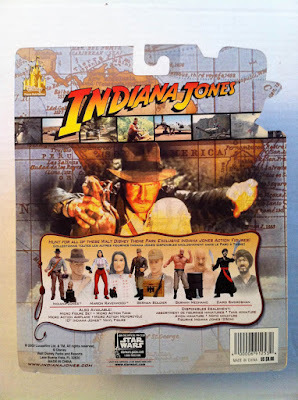 I was able to get away with a bunch for Indy, but the rest of the characters were limited to 2 or 3. So I tried to make them big! 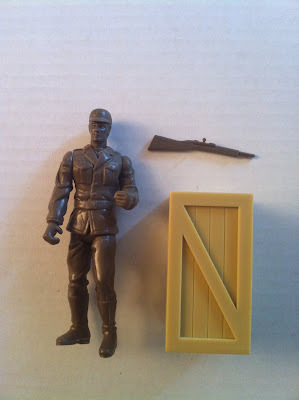 And lastly, the German soldier. This photo is of the paint master. 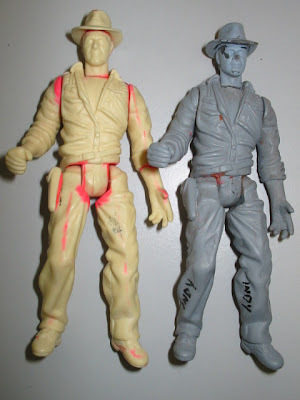 I always send 2 copies to the factory, the mold master and a paint master. 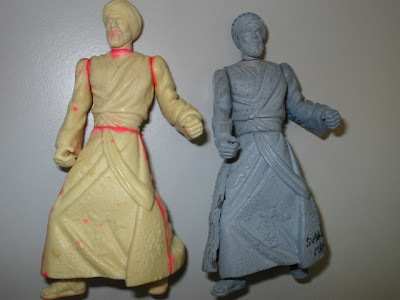 This is what they will use as a guide to paint all of the figures. Another big accessory, the Ark crate. The German Soldier is the rarest of this series, as it was pulled from the park stores shortly after the collection arrived due to it's controversial nature. I'm not sure if the inventory was warehoused of destroyed, but they are really hard to come across. Hopefully you have one in your Indy collection! No, This is not the new Terminator! It's Bryan Fulk, model maker, sculptor, prop guy, and good friend! One of the first projects Bryan worked on for me was "The Guild Sells Out" Christmas special I directed in '09. I think it was only his second day at the Barnyard when he ended up pulling an all-nighter helping me paint dozens of the ZABOO PHEROMONE SPRAY props. 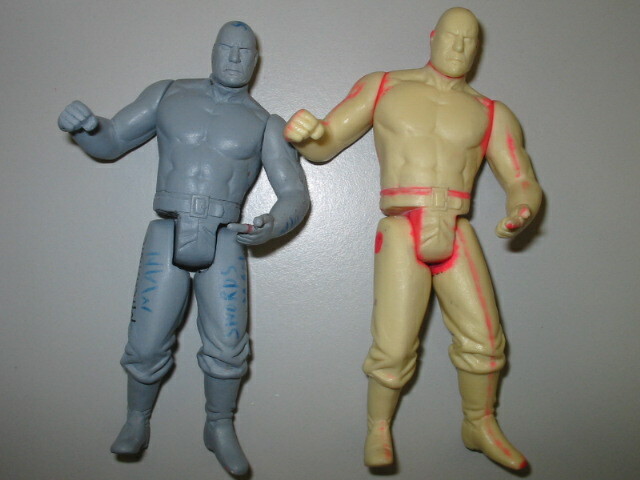 It turns out, even though Bryan is actively working in film and television, he has always dreamed of making toys and figures. So Christmas was the perfect time for him to end up at the Barnyard, or, as it is called at that time of the year, North Pole West. 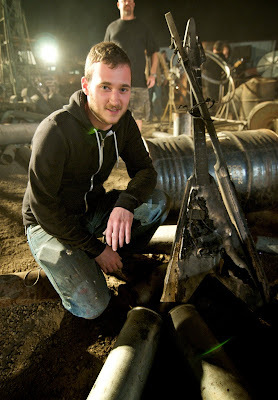 Bryan has worked on countless projects with me since then, including favorites such as "Legend of Neil" season 3. I've heard a rumor that LON may finally make it to DVD. Definitely buy one! And if you look close in the "GLOFFICE" episode, you might catch a glimpse of a few motivational posters dressing the walls. 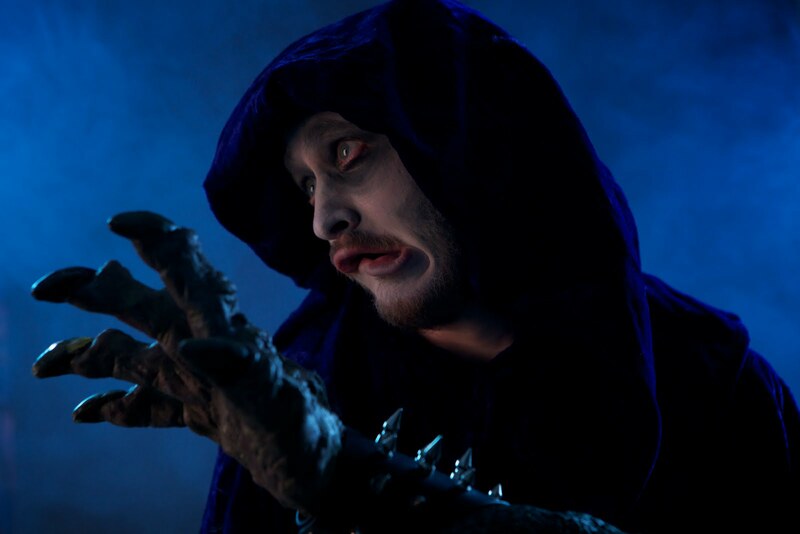 Bryan portrayed the Wizrobe for this "SLAPPED" edition. And then there was the music video that crashed Twitter! Remember that? The 80's metal band ACCEPT was great to work with, but we had no idea that their band name was a backdoor code to force tweeters to follow you. We caused a bit of a panic there for a day or so. I blame the prop Flying V guitars Bryan built. We set them on fire as a foreground piece as the band rocked out. Oh, and a valuable tip from that shoot: Never use real barbed wire at night!!!!! If you were at the Star Trek convention in Vegas last year, you might have seen the Borg Queen I created for the Roddenberry party. Bryan came out to help get her and several other Borgs assimilated quickly. I have some crazier pictures from that trip, but I don't want to embarrass him on his birthday! Alright, maybe just a little! Here we are at the Pajama Party late night screening of my movie "How to Make Love to a Woman " during the Feel Good Film Festival. First, it's not an instructional video, it's a romantic comedy. Second, we dared each other to have the craziest pajamas. I showed up in my T-rex footy pajamas made by Ginny McQueen. But Bryan beat me in his panda footies. As you can see, Marissa is attempting to break up a fist fight. Those pajama parties get rough! I've been trying to figure out what to get Bryan for his birthday for a while. He is a huge Teenage Mutant Ninja Turtles fan, but the problem is, he has EVERYTHING! 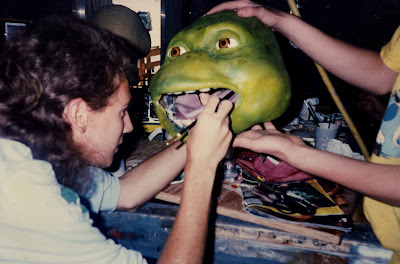 Recently, I found a few molds from when I worked on the animatronic Ninja Turtle heads from the live stage show about 20 years ago! 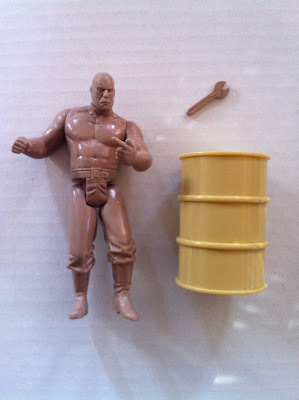 I'm going to try to dig the rest out of storage and put together a bona fide Turtle head for him. But that may take a while. Especially if he doesn't help me. And that's weird, making someone assist on their own birthday present. So in the meantime, Bryan, Happy Birthday! Here's a photo from the past showing what your gift of the future will look like! And the icing on the cake? You can make fun of my 80's Farrah Fawcett hair.